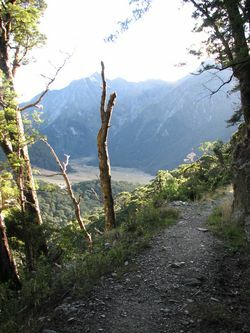 The Gillespie Pass guided trek is located in the heart New Zealand's Mount Aspiring National Park. 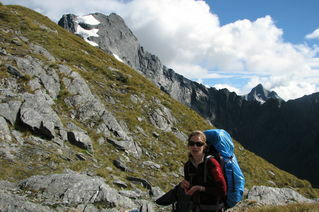 The Young-Siberia-Wilkin round trip includes Gillespie Pass at over 1500m, a stunningly beautiful location. The track begins in dense temperate rain forest, and steadily climbs into wondrous alpine paradise. We finish the trip with a thrilling jet boat ride back to civilization. On this trip we use Young hut for the first night, and camp out on the second and third nights. 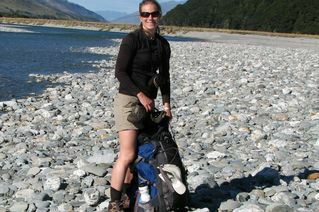 Our professional guide will ensure your safety, as we explore this remote and seldom visited area. 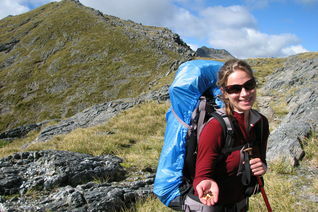 On the Gillespie pass trek you will be required to carry your own sleeping bag and thermarest. You can bring your own sleeping gear, or we will provide it at no extra cost. If the native flora is your interest, the primordial plant associations will amaze you. Eighty percent of the native plant species are found no where else in the world! This is an experience you will never forget. We meet you on the lakefront in Wanaka. After checking through the group's gear, we depart for the township of Makarora. If the rivers are high then Jet Boat access to the start of the track is provided. The Young Valley is a wonderland of dense native forest and high peaks. The trail steepens and climbs steadily to tree line. Tonight we stay at the new Young Hut. Waterfalls, roaring canyons and beautiful temperate rainforest, a big day! The track winds its way up the valley sidewall under the awesome east face of Mount Awful. This is really an alpine paradise, with hanging snowfields and waterfalls galore. The track passes though open meadows, that after 3 to 4 hours leads to the pass. The steep track winds up and up (and up) ending at Gillespie Pass, and one of the great view points of the Southern Alps. From here there's an impressive view, with Mounts Alba and Awful dominating the skyline. Two hours downhill and we reach our camp next to the tranquil Gillespie Stream. We leave our packs behind today, as we do a day trip to Lake Crucible. This unusual lake sits high above the Siberia Valley, nestled under Mt Alba. It is a steep climb through a forest, with a small river crossing, and finally the ascent through a snowgrass flat until you reach the lake. Surrounded by towering walls, Lake Crucible is a geographic wonder, carved by the glaciers. 14 km return -- 7hrs -- 880m ascent -- 880m descent. This is the easy day, so a sleep in and big breakfast are welcome after the big days so far. 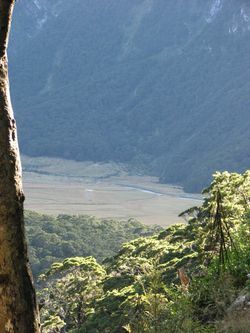 From our camp the track takes us through ancient beech forest and open river flats. Great views of Mount Awful and Mount Dreadful (The early explorers had fun with the names here) with the Siberia River in the foreground. Bring your camera! 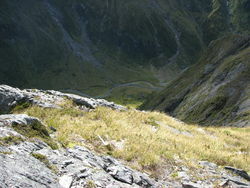 It is all downhill to Kerin Forks Hut, at the confluence of the Upper Wilkin and Siberia Valleys. Here we meet our waiting jetboat for an exhilarating ride back to Makarora. It is a wild finish to a Wild Walk! Prerequisites - To enjoy your Gillespie Pass trek you need to be fit and have good balance. The prepared track is rough, and sometimes wet. Sometimes the footing is unstable. Hikers need to be good on their feet, and be comfortable on rough or slippery ground. Hikers should be able to maintain a slow but steady pace up hill for an hour, between rest stops. There is plenty of time to rest, swim, and take photos. Group Size: Min of 2. Includes Wanaka airport pickup & dropoff. Accommodation pre & post hike.